Hayley, who’s known Lina for 5 or 6 years from their 9-5 days, and Matt asked us for venue recommendations in the area, and we had to recommend Cripps Barn. We shot a great wedding there a few years ago, and we knew they’d love it – the setting is incredible, the family who run are so friendly and there’s bags of natural light (turning cosy in the evenings too). Our first glimpse of her dress, a Maggie Sottero gown accompanied by a veil from Shades of White in St. Ives, was when it hung from a wooden hanger monogrammed with the date of the wedding. 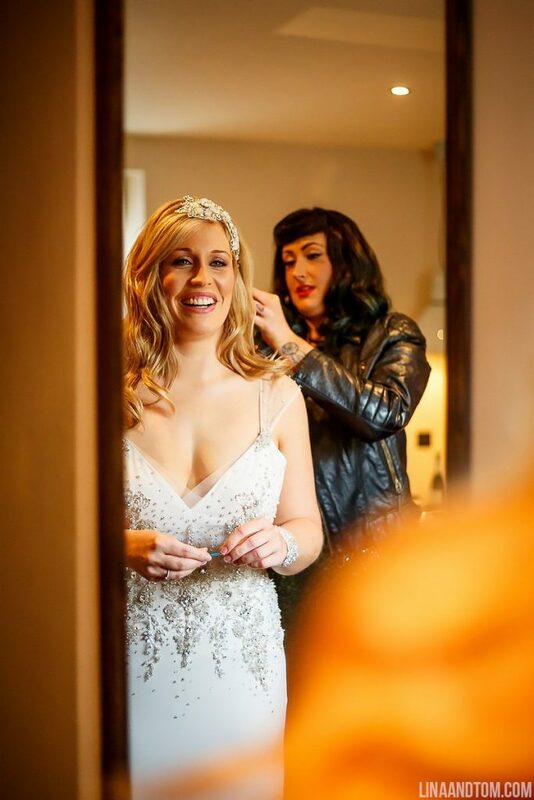 Hayley chose her accessories carefully too, a ‘something borrowed’ Rocks for Frocks sparkly headpiece from her sister, a beaded bracelet from Anna Campbell completed with a cosy golden faux fur coat from Coast. Perfect to keep the autumn winter chills at bay during the day. The bride sparkled! Onto the groom and the groomsmen who took a relaxed approach to the wedding day prep, starting with beers and some fun shots at a nearby cottages. What we really enjoy doing on a wedding day is letting people get on with their day, and this means we get natural and genuine shots of the couple and their guests. You can really see the quiet anticipation in these photos, and the excitement too! Want the details? The groom and groomsmen chose navy three-piece suits with blue tweed accessories from Jack Bunneys. Matt chosen an extra special touch for his – wearing his granddad Stan’s red braces. Something old and something borrowed, who cares that they weren’t blue! 😉 Their outfits were complete with simple blush pink rose buttonholes. The majority of the guests had arrived the day before, for this wedding weekend, so just before the ceremony, the anticipation was huge. The barn filled up with excited family and friends, who slowly took in the old-world charm, incredible ceilings and the stunning floral chandelier. How cute are the page boy and flower girl! Despite the venue being so majestic the ceremony felt cosy. The candlelight, twinkly fairy lights and the lush floral displays (by Beth Cox by Go Wild Flowers in Cheltenham) made the ceremony ethereal and intimate. As the guests took their seats, the barn grew quiet and the ceremony began. Inside these beautiful four walls, the couple became husband and wife. We felt so fortunate to be shooting Matt and Hayley’s day in this historic venue and their reaction to each other gave us all the feels. We love Cripps Barn, and photographing weddings in the Cotswolds, and we definitely recommend this venue if you’re planning a wedding around Oxfordshire or Gloucestershire. It has bags of atmosphere all year round. Time to party! After a quiet romantic ceremony, things kicked up a notch. Seen Love Actually? The couple had the fabulous No Limit Street Band play them out of the ceremony, just like the film! Then cocktails were served – we love this photo of Hayley having her first drink after the ceremony. Before the wedding breakfast we were able to whisk the newlyweds away for couples shots in the grounds, among the golden autumn leaves. When you’re planning an autumn or winter wedding do be mindful of the shorter days, we always advise our couples to time their day so we can capture photos in daylight. Back to the reception, and the barn was ready for a sumptuous wedding breakfast, a steak dinner. We loved the extra touch of having one person carve the steak at the table for the rest of the diners; the carver was even given their own apron! Let’s not forget the sweet treats for the evening – and our couple put lots of effort to ensure pudding was unforgettable! The bride’s sister is a caterer (very handy!) – Lindsey from Puddini Catering – who made a pretty naked wedding cake. The three-tiered Victoria sponge was simply decorated with buttercream, roses and fresh fruit. Cake toppers were in the form of little sheep figurines, a cute nod to the rural location. It didn’t stop with the cake though; there was a sweetie table for pick and mix lovers, plus a whole array of cookies, doughnuts and millionaires shortbread from Tom’s Kitchen. Then we had unicorn poo (caramel flavour!) mini meringues and chocolate brownies from The Meringue Girls of London. All of this was quite excellent dance floor fuel, which is handy because guests can party ‘til 1am at Cripps Barn. After much eating and drinking, the No Limit Street Band returned to get the party started, and after a gorgeous first dance, they kicked the roof off by playing some brass band versions of classic songs like Insomnia by Faithless. After a little partying, we paused on the music for some fantastic fireworks. It had started to rain but the huge barn windows provided a great viewing point for the festivities outside. Later, some guests briefly braved the rain for some sparklers outside. Just after the fireworks, the rain really started come down, so we grabbed our couple (and Hayley’s cosy faux fur coat) for some rainy couple shots. Rain on your wedding day can be such an incredible gift (really), especially at night. We were so pleased to end this fun day with this shot. Happy Anniversary Matt and Hayley – it’s been fantastic remembering your special day. We hope your first year of marriage has been wonderful. Venue: Cripps Barn, Bibury, Cotswolds. Wedding dress: Maggie Sottero, with veil from Shades of White, St Ives. Bride’s faux fur coat: Coast. Bride’s accessories: Beaded bracelet by Anna Campbell. Beaded floral headpiece from Rocks for Frocks. Bridesmaid dresses: Chi Chi London, ASOS. Make-up artist: Emily Tarrant, Northleach. Mother of Bride and Bridal hair: Charlotte Harding, Cambridge. Bridesmaid’s hair: Laura Leigh, Laura Leigh Hair & Beauty, Cheltenham. Bridal party beauty treatments: English Rose Beauty House, Willingham, Cambridgeshire. Rings: 77Diamonds, London – Blue topaz birthstone band for the bride, plain band for the groom both personalised with the couple’s nicknames inside. Groom and Groomsmen suits: Jack Bunneys. Flowers: Beth Cox, Go Wild Flowers, Cheltenham. Cake: Lindsay Scrivener, Puddini Catering. Sweetie table: Tom’s Kitchen, Cambridge.